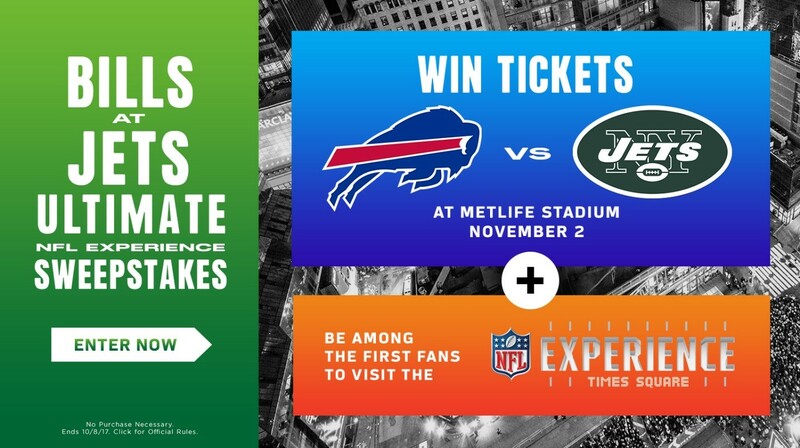 The Buffalo Bills and New York Jets have teamed up to launch the ultimate NFL Experience sweepstakes. Through the sweepstakes, two lucky fans – one from the Bills and one from the Jets – will win tickets to watch the Bills-Jets primetime matchup on Thursday, Nov. 2 and be among the first to visit the brand new NFL Experience in Times Square. The NFL Experience takes fans on the ultimate football journey. Complete with a 4D theatre, equipment room, interactives such as a quarterback challenge, and history on each of the NFL’s 32 teams, the NFL Experience has something for everyone to enjoy.